SANTA CLARA, Calif. â Nick Mullens threw for 262 yards and three touchdowns for the most productive N.F.L. debut since the merger, leading the San Francisco 49ers to a 34-3 victory on Thursday night over the Oakland Raiders in a lopsided Battle of the Bay. 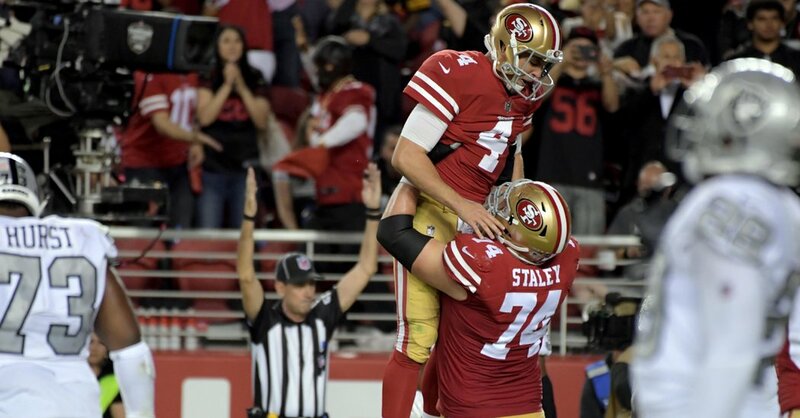 George Kittle made an impressive one-handed catch on a 71-yard play that set up his score from Mullens and Pierre Garcon caught his first touchdown pass in two seasons with the 49ers (2-7), who ended a six-game losing streak and won for just the second time in two years without Jimmy Garpppolo at quarterback. Mullens got the nod after C. J. Beathard injured his right wrist last week and made the most of his opportunity against a defense for the Raiders (1-7) that is one of the worst in the league. He performed so well that he even got his Twitter account verified during the game. Mullens, who was an undrafted free agent out of Southern Mississippi in 2017, got rid of the ball quickly and took advantage of several breakdowns in coverage for big plays, including the 24-yard touchdown pass to a wide-open Garcon on the opening drive. Mullens finished 16 for 22 and had a 151.9 passer rating, the highest for a quarterback with at least 15 attempts in an N.F.L. debut since the 1970 merger. He threw touchdown passes to Garcon and Kendrick Bourne on the opening two drives and coasted from there to the most lopsided win in this series since San Francisco won the first meeting, 38-7, in 1970. Raheem Mostert added a 52-yard touchdown run, and the Niners outgained the Raiders, 405 to 248, for the game. In what was perhaps the worst prime-time matchup in N.F.L. history, only the Raiders played down to expectations. They provided little resistance on defense against an undrafted quarterback making his N.F.L. debut, did nothing offensively after settling for a field goal on the opening drive, and put together the most listless performance yet in Coach Jon Grudenâs second stint as coach. Carr finished 16 for 22 for 171 yards and was sacked five times before being replaced by A. J. McCarron in the fourth quarter. Oakland has now lost four games in a row, getting outscored by 85 points during the skid.